Not possible to see now because it is not available in shops. It is a future reality that may emerge as DNA based microprocessor. DNA based computing is an emerging technology using the biomolecule DNA as the data storage molecule. It is possible since DNA is doing data storage in the form of genetic information. If DNA computers emerge, it can store billions of times more data than the present computer. The DNA molecule of genes has the potential to perform calculations many times faster than the present microprocessors. By using the Nanotechnology, it is possible to create Nano computers to replace the Silicon based computers. Yes it is possible. 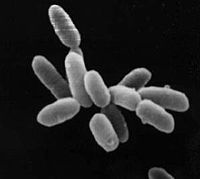 The Halobacterium salinarium can be used as a Bioswitch.The bacterial protein Bacteriorhodopsin from Halobacterium salinarium has created great interest among scientists to produce bio-logic gates functioning similar to semiconductor logic gates. It is a bacterial species living in the salt marshy lakes of California. These bacteria can survive at very high temperature of 150 degree Fahrenheit or more and in high salt concentration around six times higher than the sea water. These bacteria have a light sensitive protein called Bacteriorhodopsin (bR) in their cell membrane. This protein exhibits unusual properties of structural changes when exposed to different wavelengths of light. This property of the Bacteriorhodopsin is exploited to create molecular switches. The Molecular switches increase the possibility of fast random access and transportability of datas in Multimedia systems. If these are used in computers, appreciable amount of size reduction, fast memory access, mass storage of datas etc can be achieved. The ability of Biomolecule to work as switching devices in computers is a major area of research in the present day with the invention of some bacterial proteins which functions exactly similar to the electronic switches. Bacteriorhodopsin is the light sensitive, heat stable protein present in Halobacterium salinarium. The bR absorbs different wavelengths of light and changes its structure into different forms. For example when it absorbs Red light, its structure changes into one form and retains the structure. When it absorbs Green light, another structure is formed. Thus by exposing to Red and Green lights, it is possible to change the structure of bR exactly similar to the semiconductor logic gates giving high and low outputs in varying voltages. Not possible now because it is not available in shops. It is a future reality that may emerge as DNA based microprocessor. DNA based computing is an emerging technology using the biomolecule DNA as the data storage molecule. It is possible since DNA is doing data storage in the form of genetic information. If DNA computers emerge, it can store billions of times more data than the present computer. The DNA molecule of genes has the potential to perform calculations many times faster than the present microprocessors. By using the Nanotechnology, it is possible to create Nano computers to replace the Silicon based computers. The idea of DNA computer came from Leonard Adelman, a computer scientist at the University of South California in 1994 to solve complex mathematical problems. The first DNA computers are unlikely to feature word processing, e-mailing and solitaire programs. 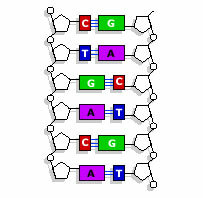 Unlike conventional computers, DNA computers perform calculations parallel to other calculations. Conventional computers operate linearly, taking on tasks one at a time. It is parallel computing that allows DNA to solve complex mathematical problems in hours, whereas it might take electrical computers hundreds of years to complete them. DNA Computing is the computational technology that uses the biomolecule DNA in the place of silicon based chips.DNA computing is otherwise known as the Bio molecular computing and is a fast growing interdisciplinary field that uses molecular biology and computer techniques in research and bio informatics areas. The DNA computing technique was developed by Leonard Adleman of the University of South California in 1994.In 2002 a programmable bio computing machine was developed using DNA as the major element. In 2004, a DNA computer was designed to study the changes in cancerous cells. In 2009 a bio computer coupled with silicon chips was introduced which was based on enzyme systems and silicon chips. This marked great advancement in the field of Synthetic biology to use integrated systems of biological molecules and electronic chips.